Welcome to the Music Store Page! LISTEN to songs from my CD’s and if you like ’em and wanna keep ’em, you can buy the hard copy albums below, or click the download links to get the digital versions. Hope you enjoy! 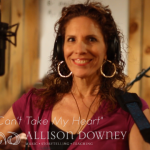 Allison’s NEW Single, “Can’t Take My Heart!” is available for download. Click BUY NOW to listen. In the song, Allison gives cancer a piece of her mind, but not her heart! Alternate versions are available for more sensitive ears.Pay What You Want! 10% of proceeds go to mucosal melanoma research.